Next weekend, May 7 and 8, the Cape Cod Symphony Orchestra performs the last concert of the season, “The Fabric of America,” with William Schuman’s New England Triptych: Three Pieces for Orchestra after William Billings; Aaron Copland’s Appalachian Spring: Suite and Lincoln Portrait; and William Perry’s Jamestown, Concerto for Cello and Orchestra. When Maestro Jung Ho Pak first heard the Jamestown Concerto, he immediately thought of cellist Matt Haimovitz, who is known for his adventurous side and willingness to learn new concerti. Matt Haimovitz’s Venetian cello was made by Matteo Gofriller, the choice of legendary cellists Pablo Casals and Janos Starker. 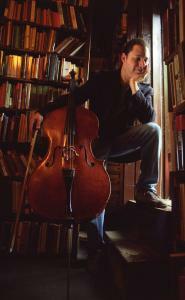 Its 300th anniversary was the inspiration for Haimovitz’ latest release, MATTEO 300 Years of an Italian Cello. Haimovitz made his debut at the age of 13 as a soloist with Zubin Mehta and the Israel Philharmonic. At 17 he made his first recording with James Levine and the Chicago Symphony Orchestra (Deutsche Grammophon). He made his Carnegie Hall debut when he substituted for his teacher, Leonard Rose, in Schubert’s String Quintet in C, alongside Isaac Stern, Shlomo Mintz, Pinchas Zukerman and Mstislav Rostropovich. Haimovitz recently released the critically-acclaimed and Grammy-nominated album Meeting of the Spirits, featuring jazz classics from the 1920s to the 1970s, reconfigured by composer David Sanford and played by Haimovitz and the eight-piece cello ensemble Uccello, with guest artists including guitarist John McLaughlin. In addition to his appearance on Cape Cod, Haimovitz recently performed at New York’s Bargemusic and Austin’s South by Southwest Festival.